Anna Netrebko, Thomas Hampson, and Deborah Voigt will give master classes at the Academy. An international music school dedicated to legendary Russian opera star Yelena Obraztsova is to open its doors to pupils this summer in St. Petersburg. The inauguration of the Academy of Music will take place at the city’s Bolshoi Gostiny Dvor on August 8. 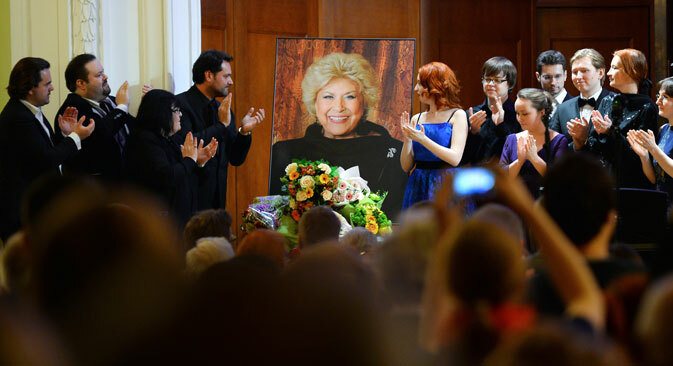 The evening will see a gala concert featuring opera stars and some of the closest friends of the legendary opera singer, who died in January. The Mariinsky Theater's leading soloist Ildar Abdrazakov is to serve as the Academy's artistic director. “Students from abroad will also be coming to the Academy. I am very often asked, both in Russia and abroad, about where I teach, where you can take a master class. Naturally, I will invite everybody to the Yelena Obraztsova Academy, where classes will be taught by professionals with a capital P,” Abdrazakov said at a press conference in St. Petersburg. “Thomas Hampson and Deborah Voigt have already agreed to my proposal. And Anna Netrebko will also come,” said Abdrazakov. In addition, the creators of the academy have promised that the country’s best teachers will teach there on a regular basis, and the school itself will become international – talented young singers from different countries will come to the institute to exchange their experiences. Yelena Makarova, Obraztsova’s daughter and the director of the academy, said that to open such an educational institution had been her mother’s dream. “It's a dream that my mother nurtured for many years. A dream that helped her fight her illness,” she said. According to her, the Obraztsova Academy will provide training for both adults and children. The purpose of opening the academy is to create a unique educational institution, taking into account the peculiarities and individuality of each student. Ildar Abdrazakov will give the first master class between November 1 and 12. Training at the academy will be provided on a fee-paying basis, but there will be 10 free places in the adult department and another 10 available for children. In addition, individual grants from Makarova and Abdrazakov are being planned. The gala concert to celebrate the opening of the Obraztsova Academy will feature Abdrazakov, Olga Makarina, Vasily Ladyuk, Yusif Eyvazov and Yelena Makarova, as well as an orchestra led by the Mikhailovsky Theater's principal conductor Mikhail Tatarnikov.